10th September 2018, New Delhi: To protest against the steep fuel prices, the opposition has announced a Bharat Bandh today. The effect of the bandh is clearly visible in many parts of the country and people are demanding for petrol and diesel to be brought under GST which will reduce the prices by around Rs. 15. After last night’s price revision, a litre of petrol as of today costs Rs 88.12 in Mumbai while in Delhi it costs Rs 80.73 per litre. Currently, petrol is taxed at a little over 100% and diesel taxes are around 66.48%. These taxes include central excise duty and VAT. Centre had increased excise duty on petrol and diesel almost 5 times since 2014. The current excise duty levied on petrol is Rs. 19.48 and on diesel is Rs. 17.69. LocalCircles conducted a 2-poll survey on the issue which received 15,000+ votes. The first poll asked what the government should do to provide immediate relief to consumers on petrol and diesel prices. 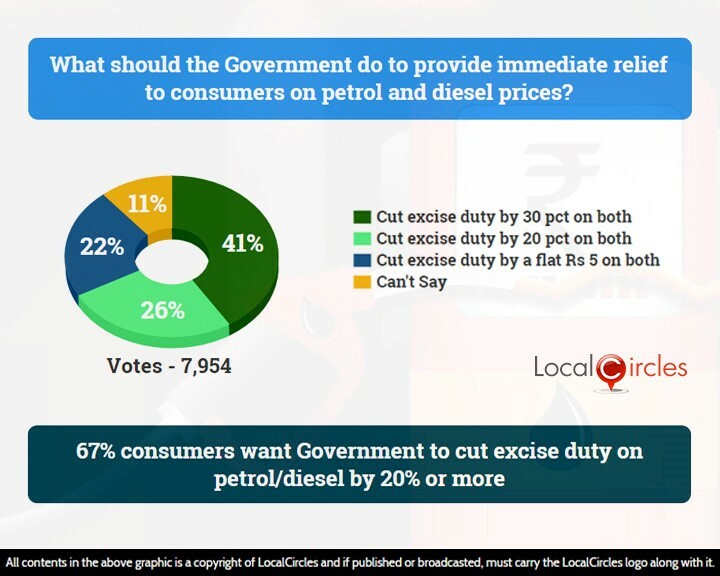 41% said they should cut the excise duty by 30 pct on both petrol and diesel, while 26% said the excise cut should be 20 pct. 22% said the excise duty should be made a flat Rs. 5 on both petrol and diesel. 11% did not have an opinion. The petrol and diesel rates in the country are currently determined by global crude oil rate and rupee-dollar forex rate. That is part of a daily system of fuel price revisions adopted in June 2017. It is to be noted that states and centre both currently make about 40% of their revenue through the sale of petroleum products. Many citizens on LocalCircles had suggested that once petroleum products are brought under GST, the states could be allowed to add a cess to it to cover up some of their revenue losses and the centre could reimburse them yearly to balance their ledgers. 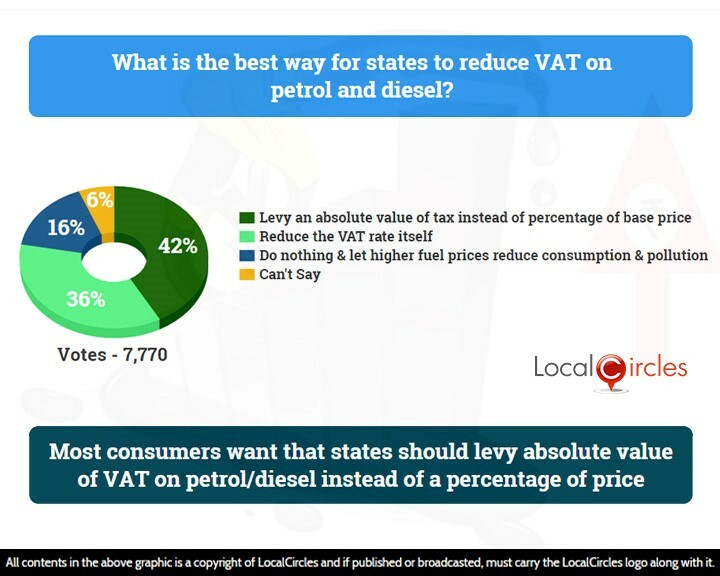 The second poll asked what the best way for states is to reduce VAT on petrol and diesel. 42% said they should levy an absolute value of tax instead of percentage of base price, while 36% said that states should reduce the VAT rate itself. 16% respondents said that the states should do nothing and let higher fuel prices reduce consumption and pollution. A small 6% were unsure about what should be done. Currently, as the international crude prices rise, the state VAT collection rises as the VAT levied is a percent of the base price of petrol and diesel. Majority consumers say they want the states to determine an absolute value of VAT per litre based on say average prices of petrol and diesel in the last 12 months. That way as the international oil prices rise, in addition to the burden of rising base prices, they are not faced with increasing tax values. Per consumers, the current formula works for the State Governments but not for consumers. 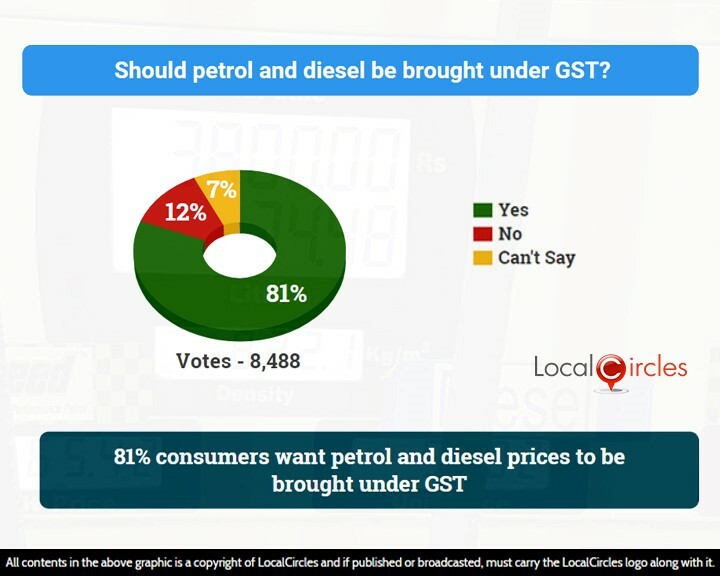 In a survey conducted by LocalCircles sometime back, citizens were asked if petrol and diesel should be brought under GST. Out of the 8,488 respondents, 81% had voted in favour of it and a minor 12% had voted against it. The Indian Oil Corporation charges around Rs. 39 per litre of petrol from the dealers and after adding excise, VAT and dealer commission, it is sold at close to Rs. 80 per litre to the consumers. Question currently in the common man’s mind is whether the Central and State Governments will step in to their rescue. People of the country were already struggling with income stagnation and reduced employment opportunities. Constant rise in fuel prices at this junction could affect consumer spending and lead to an economic slowdown, which the country cannot afford.